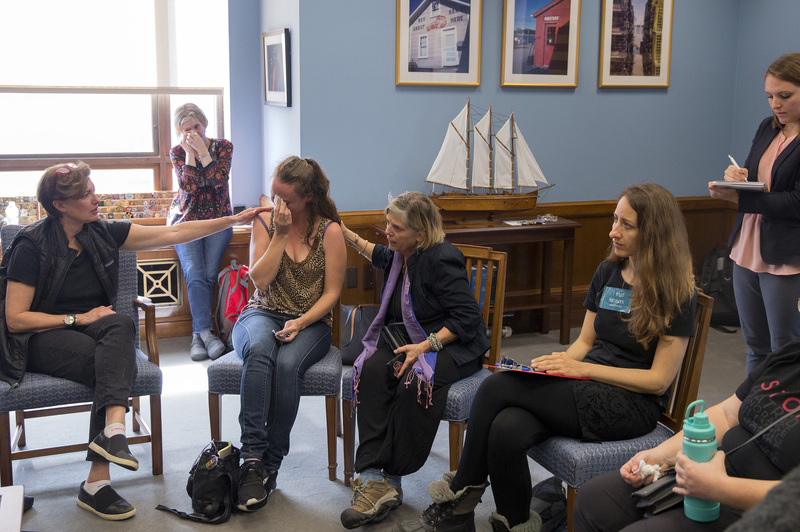 Heather Everly Berube gets emotional at the end of her statement to Sen. Susan Collins' staff member Rowan Bost, standing at far right in Collins' office in Washington, D.C. on Thursday. 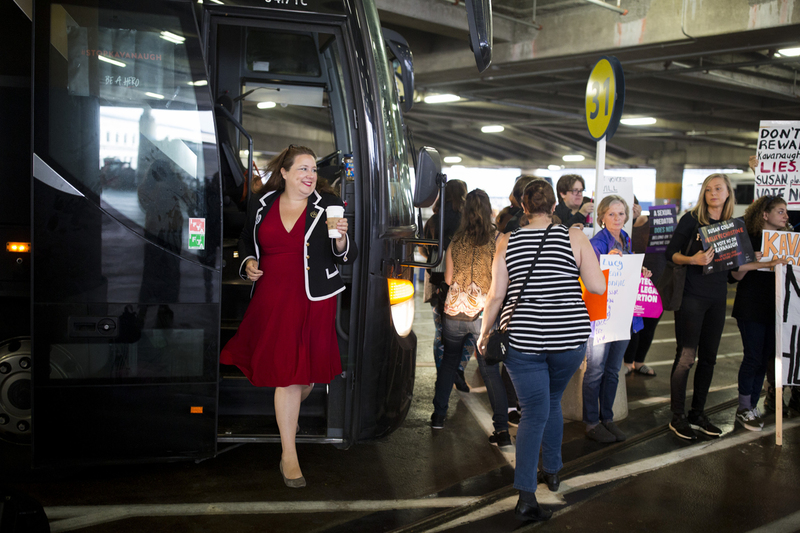 Everly Berube went to Washington with a group of Mainers on an overnight bus in hopes of meeting with Collins about Supreme Court nominee Brett Kavanaugh. 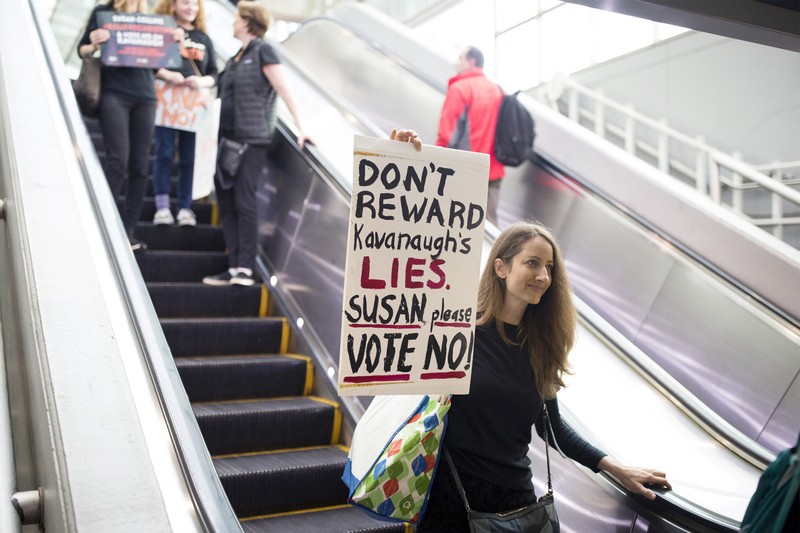 They wanted to tell her some of their stories as survivors and urge her to vote no on Kavanaugh. 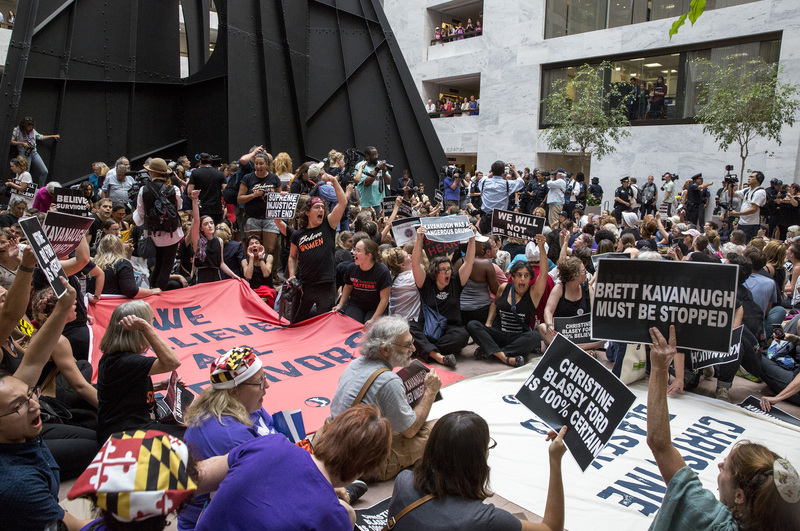 Protesters against Supreme Court nominee Brett Kavanaugh sit down and chant in the Hart Senate Office Building atrium Thursday. Hundreds of people were arrested. Nacole Palmer of Bowdoin rides the escalator at Union Station with her sign after arriving in Washington on Thursday with a group from Maine. Mainers who rode overnight by bus to Washington, D.C., in hopes of meeting with Sen. Susan Collins march to the Hart Senate Office Building on Thursday. 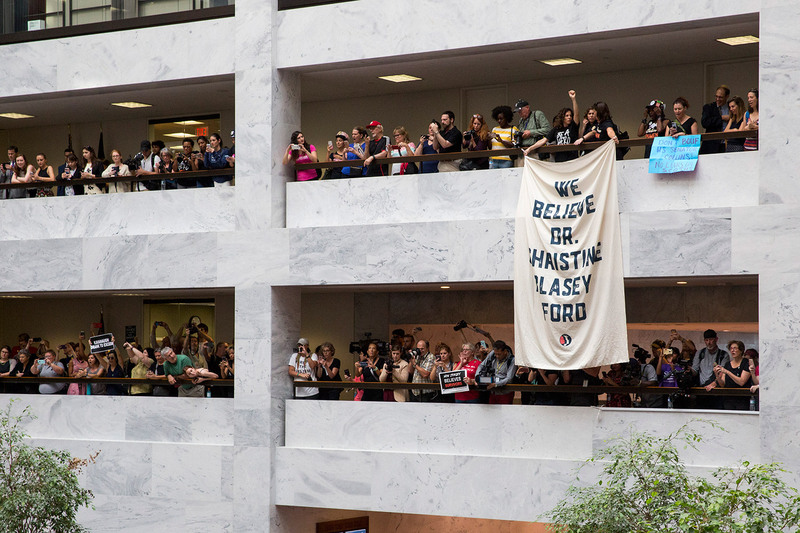 Demonstrators pack the Hart Senate Office Building atrium Thursday to oppose confirmation of Supreme Court nominee Brett Kavanaugh. Former Maine state legislator Diane Russell gets off the bus that a group of Mainers rode to Washington D.C. Russell helped organize the trip for Maine voters, hoping to get them a meeting with Sen. Susan Collins or her staff about Supreme Court nominee Brett Kavanaugh. 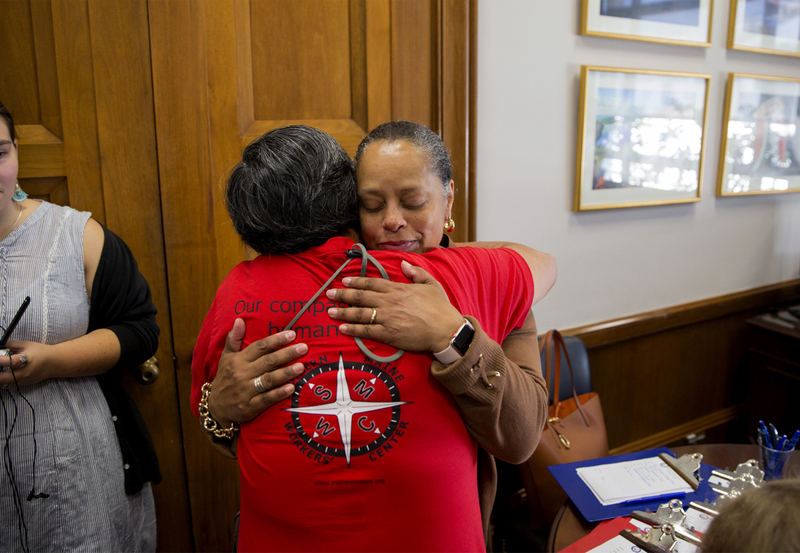 Maine state Rep. Rachel Talbot Ross of Portland hugs her friend Ina Demers after running into Demers leaving Sen. Susan Collins' office in Washington, D.C., on Thursday. 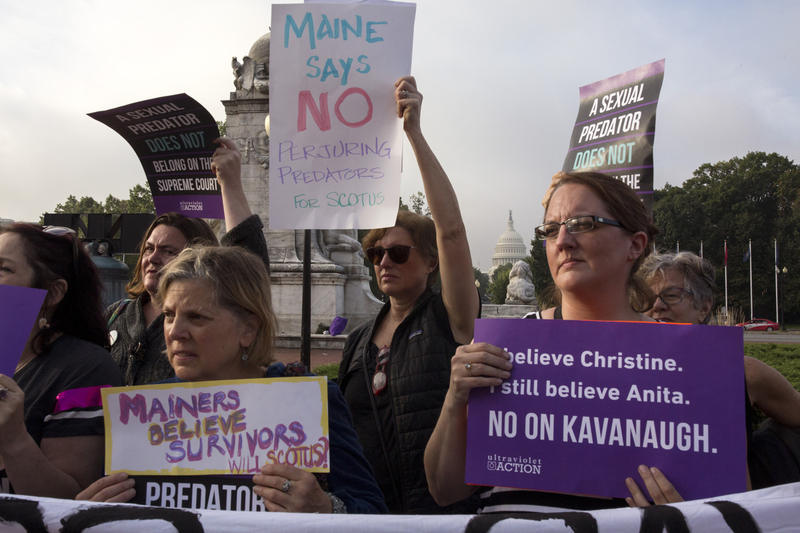 Talbot Ross went to the capital with a group of women elected officials from Maine to talk with Collins' staff about Supreme Court nominee Brett Kavanaugh. She said she didn't know Demers, who works for Portland Public Schools, would also be there. 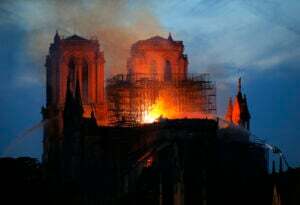 "It was a really wonderful surprise," Talbot Ross said. 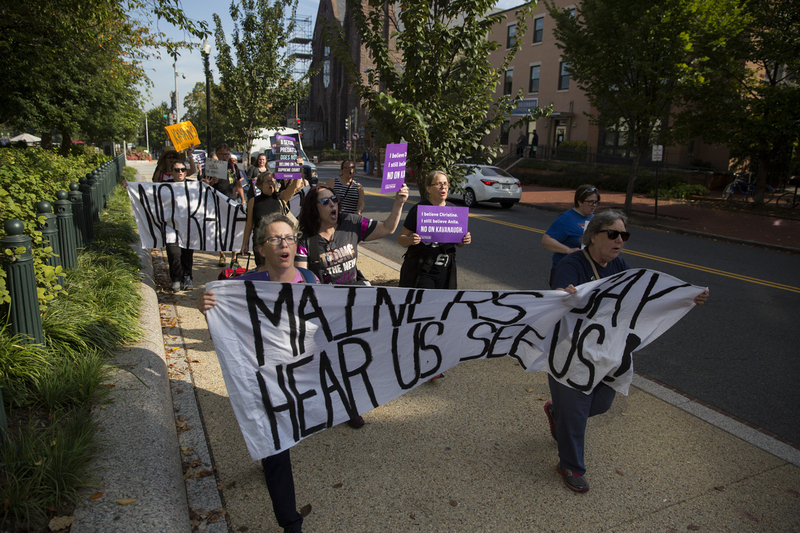 "It just goes to show that Maine women are coming from all over the state and they are getting down here to show how important this is. 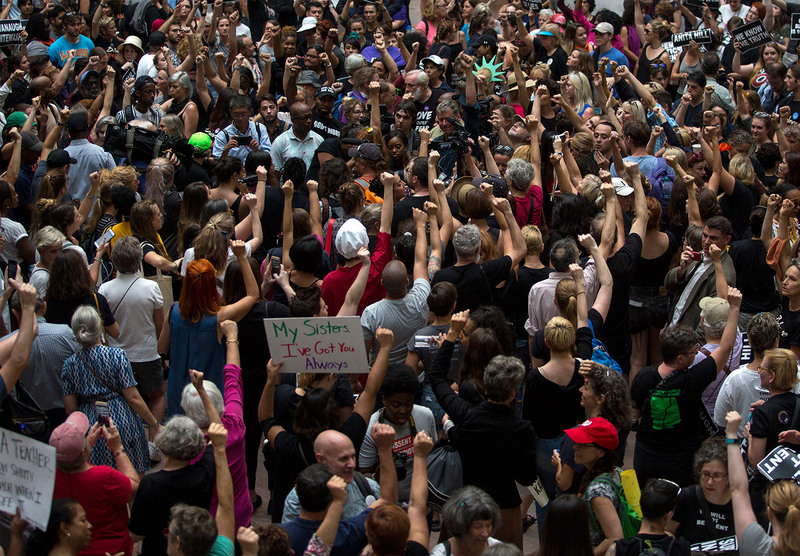 I've been overwhelmed by the kind of energy and sisterhood that this has created." 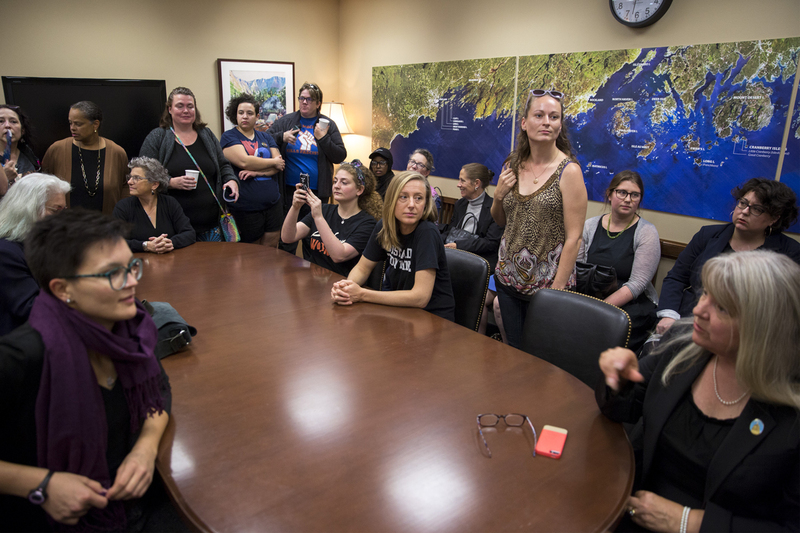 A group of Maine voters who traveled by bus to Washington, D.C., wait alongside Maine elected officials Thursday in a conference room in Sen. Angus King's office. 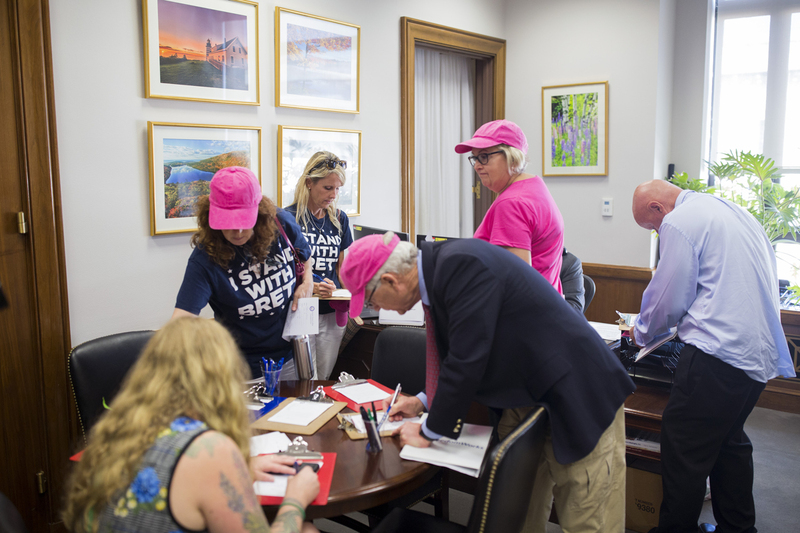 Supporters of Brett Kavanaugh from Maryland and Virginia write comment cards in Sen. Susan Collins' office on Thursday. Mainers who went to Washington in hopes of meeting with Sen. Susan Collins pose for a photo Thursday with the Capitol building in the background. 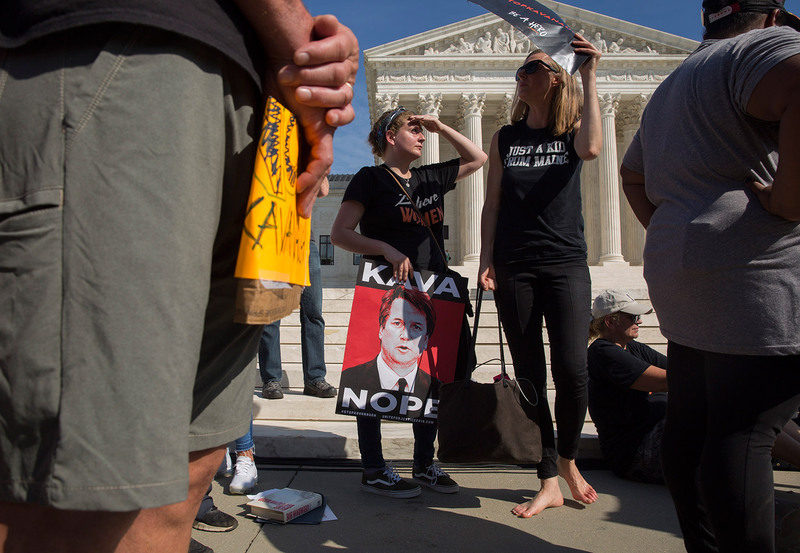 The scene outside the U.S. Supreme Court building Thursday as opponents of Brett Kavanaugh demonstrate against his confirmation. 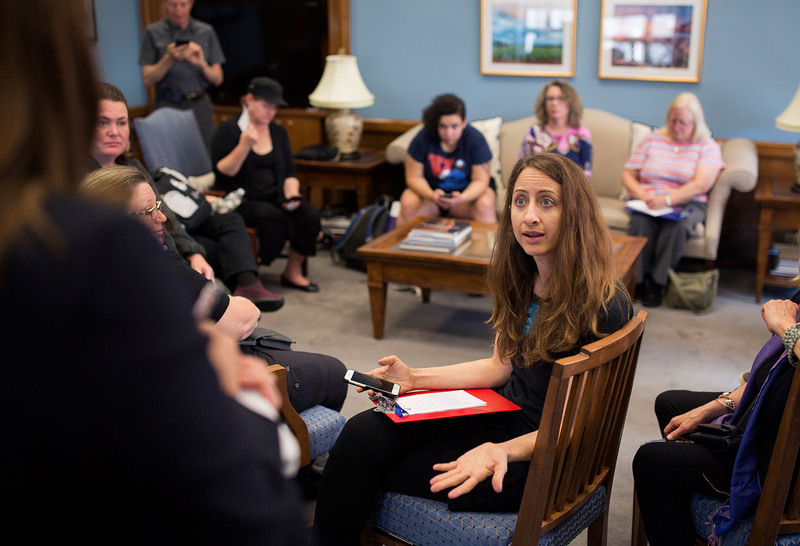 Nacole Palmer of Bowdoin voices her concerns to Sen. Susan Collins' staffer Rowan Bost during a meeting Thursday on the Supreme Court nomination of Brett Kavanaugh. 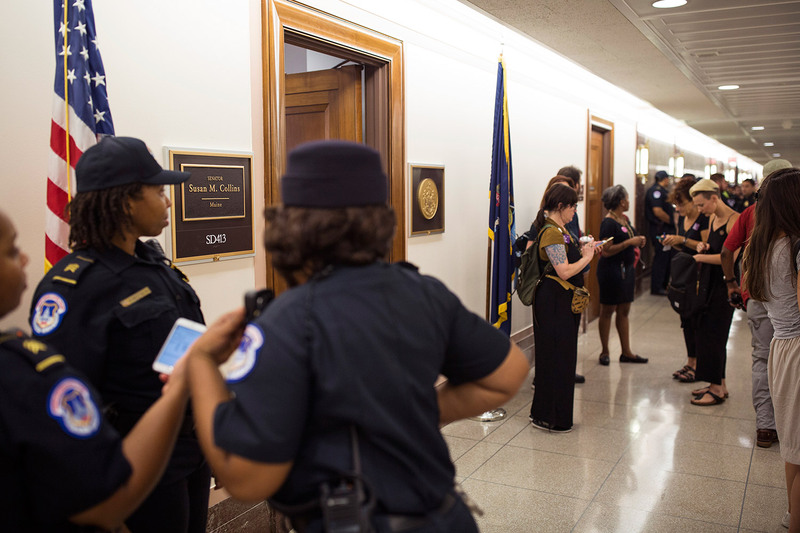 Police, constituents and media members fill the hall outside Sen. Susan Collins' office in Washington, D.C., on Thursday. 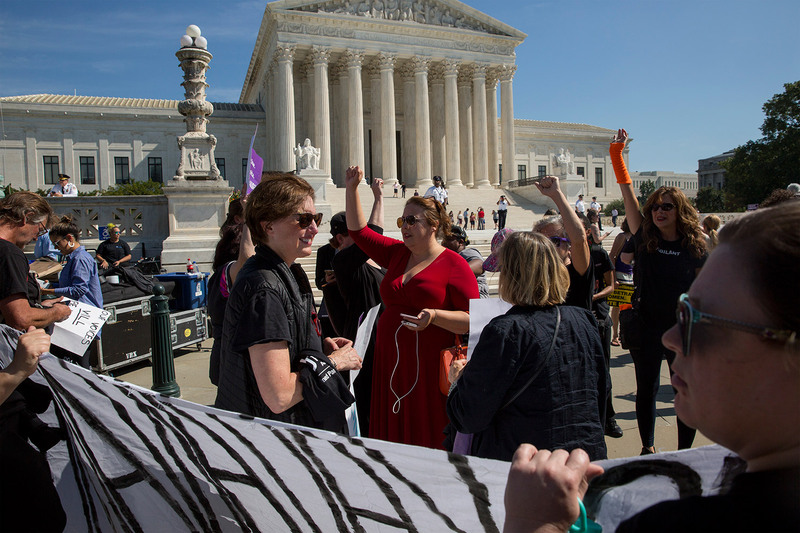 Kendall Dienno, left, and Emily Qualey, neighbors from Portland, stand in a group of Mainers at a rally outside the Supreme Court on Thursday. 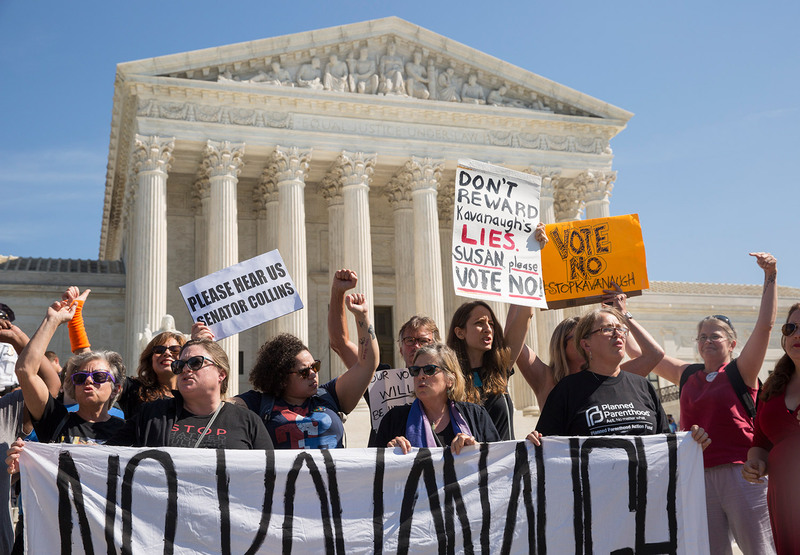 Demonstrators from Maine chant "Susan Collins we're your voters" at a rally against Brett Kavanaugh on Thursday outside the Supreme Court in Washington, D.C.
A crowd in the Hart Senate Office Building atrium demonstrates against Supreme Court nominee Brett Kavanaugh on Thursday. Hundreds of people sat on the floor and chanted, choosing to be arrested. 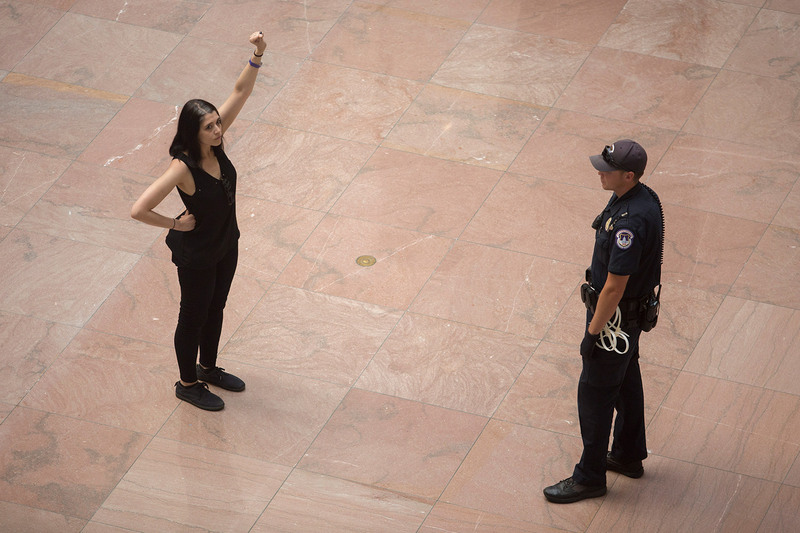 A protester faces a police officer Thursday in the Hart Senate Office building atrium. 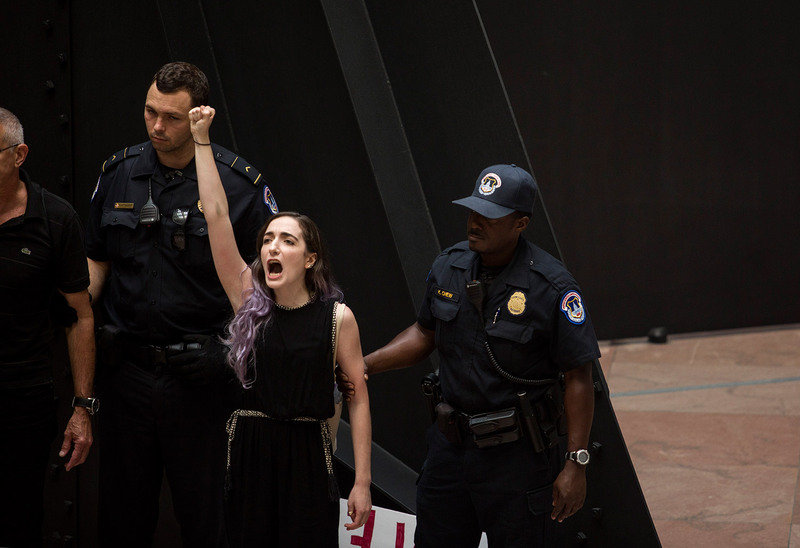 A protester is arrested in the Hart Senate Office Building atrium Thursday. 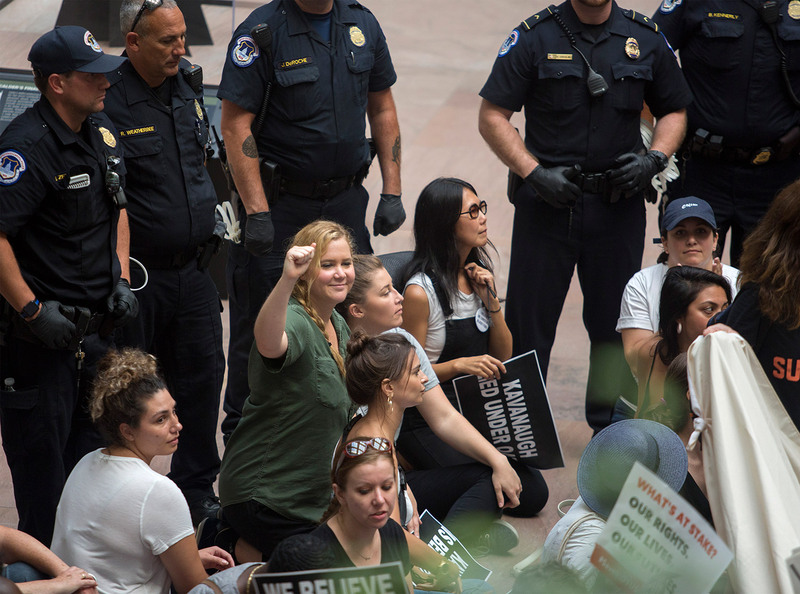 Actress and comedienne Amy Schumer sits among protesters Thursday in the Hart Senate Office Building atrium. Schumer was among the hundreds of people who sat on the floor and chanted. 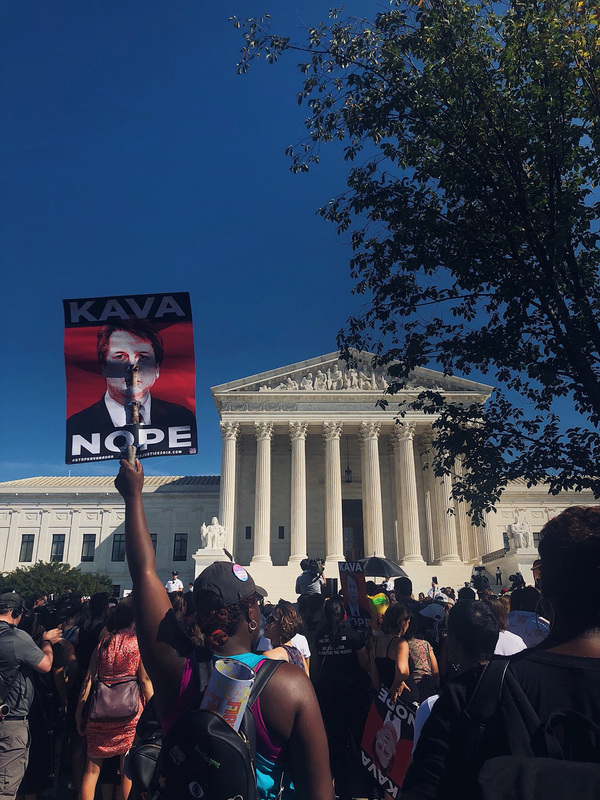 Mainers rally against Brett Kavanaugh's nomination Thursday outside the Supreme Court. The group went to Washington in hopes of meeting with Sen. Susan Collins about her vote on the Supreme Court nominee.